Dr. Chi accepts the following list of insurance providers. Select your insurance provider to see more details. I have been an attending surgeon at Memorial Sloan Kettering for more than 19 years. I have devoted my career to caring for women with cancerous and noncancerous gynecologic diseases, including cervical cancer, uterine cancer, ovarian cancer, and vulvar cancer. Since 2010, I have served as Deputy Chief of the Gynecology Service, and I have been head of the Ovarian Cancer Surgery Section since 2014. My mother was an ob-gyn, so I entered my residency thinking I would take over her practice. However, during my first year of training, I was exposed to gynecologic oncology patients and the procedures used to treat their cancers. I saw how quality of care and surgery were so essential to good outcomes for these patients. This inspired me to go into the subspecialty of gynecologic oncology. I wanted to develop an expertise in advanced ovarian cancer surgery because I saw that this was the area where training, skill, dedication, and perseverance made the most difference. In my clinical practice, I have particular expertise in the use of minimally invasive surgical techniques. Using this advanced technology helps improve outcomes for women with early stage cancers of the ovaries, uterus, and cervix. When appropriate, I offer my patients newer treatment options such as sentinel lymph node biopsy, fertility-preserving surgery, and robotic surgery, as well as panniculectomies (removal of excess fat from the lower abdomen). These techniques improve outcomes, both surgically and cosmetically, and ultimately help improve quality of life for patients. When women with known or suspected cancers — especially those with advanced ovarian cancer — first come to see me, they are often concerned with removing the cancer as soon as possible. I reassure all my patients that together we will decide on the best treatment plan in the timeliest manner possible. For women who need surgery, we try to schedule their procedure as soon as possible from their initial consultation date, but we also need to take time to make sure the appropriate surgery is done and not rush into a decision. I also remind my patients that we have a team of dedicated surgeons, medical oncologists, radiologists, pathologists, anesthesiologists, and nurses who are all committed to their care. As a result, we have some of the best surgical outcomes for advanced ovarian cancer in the world. Our patients’ quality and quantity of life is our top priority. 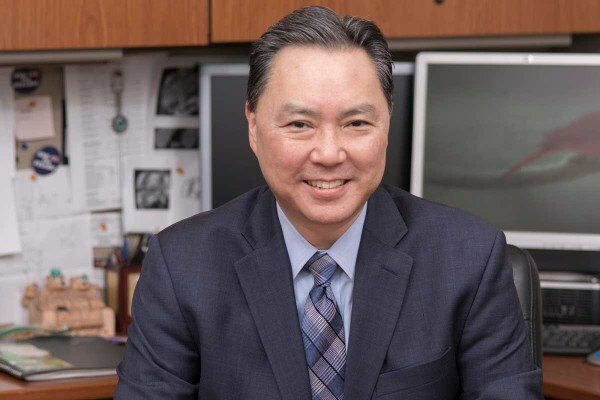 Over the past 20 years, I have dedicated much of my research to exploring ways to expand and improve our surgical management of ovarian, fallopian tube, and peritoneal cancer. I have published more than 100 papers on surgery for ovarian cancer and am the principal investigator of many institutional and multi-center trials that are aiming to improve outcomes for women with this disease. In addition, I — along with my colleagues at the University of California, Irvine and UCLA — have recently edited the third edition of the book Ovarian Cancer: Principles and Practice. I have been the lead author of many major ovarian cancer presentations and am passionate about collaborating with my colleagues around the world. Some of our current clinical investigations at MSK include identifying ways to decrease the need for blood transfusions during surgery, decrease infections, and administer heated chemotherapy directly into the abdomen after the removal of cancerous tumors. I have also worked with international colleagues to establish clinical guidelines for determining appropriate candidates for second and third surgeries in cases of recurrent ovarian cancer. My goal is not only to improve the quality of life and long-term remission for women with difficult cases of very advanced or recurrent disease, but also to offer hope where very little may have existed before. In addition to my clinical and research activities, I have served on many national and international professional committees, including the American Board of Obstetrics and Gynecology, the Society of Memorial Gynecologic Oncologists, the Metropolitan Gynecologic Cancer Society, and the Gynecologic Cancer Task Force of the American Joint Commission on Cancer. For many years, I have been Director of the Society of Gynecologic Oncology’s annual postgraduate surgical courses aimed at instructing gynecologic oncologists throughout the world on the most up-to-date surgical treatments for women with gynecologic cancers. I am also on the faculty of the European School of Abdomino-Pelvic Surgery in Gynecologic Oncology, based in Italy. Our passionate mission is to improve the care and outcomes of women with gynecologic cancers — not just in our own countries, but everywhere. Outside of work, my most important role is husband and father of three children. I enjoy playing sports, but over the years have shifted from playing them myself to watching professional sports and being the number-one fan for my son, who plays baseball. Surgery for Ovarian Cancer: Principles and Practice. 3rd ed. Bristow RE, Karlan BY, Chi DS, eds. New York: Informa Healthcare; 2015. “Cancer of the ovary, peritoneum, and fallopian tube.” Chi DS, Kauff ND. In: PRECIS: Oncology. 3rd ed. Danvers MA: American College of Obstetricians and Gynecologists; 2007: 88-100. “Cervical cancer.” Chi DS, Perez CA, Kavanagh J. In: Cancer Management: A Multidisciplinary Approach. 11th ed. Pazdur R, Wagman LD, Camphausen KA, Hoskins WJ, eds. Norwalk, CT: UBM Medica; 2008: 465-496. “Pelvic exenteration.” Levine DA, Bochner BH, Chi DS. In: Atlas of Procedures in Gynecologic Oncology. 2nd ed. Levine DA, Barakat RR, Abu-Rustum NR, eds. London: Informa Healthcare; 2008: 93-116. “Extended pelvic resection.” Diaz JP, Boland PJ, Chi DS, Abu-Rustum NR. In: Atlas of Procedures in Gynecologic Oncology. 2nd ed. Levine DA, Barakat RR, Abu-Rusturn NR, eds. London: Informa Healthcare; 2008: 137-144. “Hand-assisted laparoscopic splenectomy.” Diaz JP, Chi DS. In: Atlas of Procedures in Gynecologic Oncology. 2nd ed. Levine DA, Barakat RR, Abu-Rustum NR, eds. London: Informa Healthcare; 2008: 267-270. “Surgical principles in gynecologic oncology.” Chi DS, Gallup DG, Bristow RE. In: Principles and Practice of Gynecologic Oncology. 5th ed. Barakat RR, Markman M, Randall ME, eds. Philadelphia: Lippincott, Williams & Wilkins; 2009: 269-287. “Secondary cytoreductive surgery.” Bristow RE, Chi DS. In: Surgery for Ovarian Cancer: Principles and Practice. 2nd ed. Bristow RE, Karlan BY, Chi DS, eds. New York: Informa Healthcare; 2010: 218-234. “Advanced cytoreductive surgery program development: building a cytoreductive team.” Zivanovic 0, Chi DS, Karlan BY. In: Surgery for Ovarian Cancer: Principles and Practice. 2nd ed. Bristow RE, Karlan BY, Chi DS, eds. New York: Informa Healthcare; 2010: 291-300. “Video-assisted thoracic surgery.” Eitan R, Chi DS. In: Textbook of Gynaecological Oncology. 2nd ed. Ayhan A, Reed N, Gultekin M, eds. Ankara, Turkey: Gunes Publishing; 2011. “Secondary cytoreduction in the treatment of recurrent ovarian cancer.” In: Textbook of Gynaecological Oncology. 2nd ed. Ayhan A, Reed N, Gultekin M, eds. Ankara, Turkey: Gunes Publishing; 2011. Visit PubMed for a full listing of Dr. Chi’s journal articles. Pubmed is an online index of research papers and other articles from the US National Library of Medicine and the National Institutes of Health.